The ultimate guide to La Tania ski holidays in 2019 & 2020. 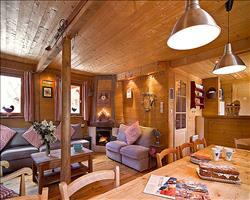 The charming little village is a modest, family-friendly gem of the Three Valleys. With excellent access to the world’s biggest linked ski area and beautiful views from attractive tree-lined runs leading into this laid-back settlement, it’s an understated location to experience the Savoyard delights of snug accommodation and melt-in-the-mouth food at great value. Nestled in the forests between Courchevel and Meribel offering excellent access to both resorts, La Tania is known as the best kept secret of the Three Valleys. It is also the youngest establishment in the area, built to host the athletes of the 1992 Winter Olympics. Proud to be eco-friendly, the resort facilities are powered by a hydro-electric system. Despite its modernity, the village has been designed in-keeping with traditional wooden Savoyard architecture, integrated amongst the beautiful forest scenery. The local businesses are mostly Brit-owned, but visitors can still expect to find very French sights and cuisine. La Tania is cheaper and quieter way to experience the Three Valleys, with excellent access to the surrounding slopes and less people queuing for lifts up the mountain. At a respectable altitude of 1400m, the resort is good for ski in-ski out accommodation, with speedy gondolas and chairlifts to get you around the resort in no time, plus slopes which run right through the village for rides back to your doorstep. The range of slopes up the mountains is all-encompassing, with long greens for total beginners and an expansive area to cover for the more advanced. Most visitors purchase a Courchevel ski pass and find this provides more than enough terrain to explore in a week. Other passes are available to gain further access to Meribel, Val Thorens and more. The amenities to be found here are limited but comprehensive, and the lesser quantity is certainly made up by quality. There are superb restaurants and local favourite bars to choose from. 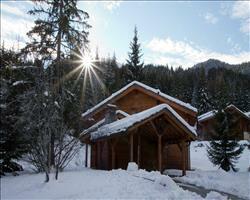 It is a lovely destination for families with excellent childcare services and ski schools. Since the village is rather small the facilities are all just a short walk apart so you don’t have to carry those skis very far at all. View our detailed La Tania snow forecast or snow report and see all live webcams, piste maps, road and travel maps and lift pass prices. For a picture of historic snow conditions see the snow depths month by month with our La Tania snow history. Long green, blue and red tree-lined slopes overlook the village, and the Three Valleys provides a ginormous amount of opportunities for all different abilities. You can make your way over to Courchevel and Meribel on skis alone. There are a wide range of ski and snowboard schools offering group and private lessons for all ages. There are gentle green runs for novices from the top of the gondola all the way back down to the centre. The blue run ‘Folyères’ on the other side of the lifts is a great place to develop a growing confidence. Those looking for more challenging greens and blues can then travel across to the linked runs over in Courchevel. Fantastic groomed pistes await intermediate skiers, with an excellent red runs and steeper blues to adventure above the village and all over the valleys. Five runs descend down from the Chenus and Loze peaks, branching down through more paths for great challenge and variety between them all. Advanced skiers can enjoy plenty of menacing black runs. Coming down from the Vizelle are multiple options such as the ‘Grand Couloir’, which threatens some intense moguls, or the rocket down the sharp inclines of ‘Dou Des Lanches’ above La Tania. Off-piste lovers can shoot off into exhilarating tree-lined runs back down to the village. It is recommended to hire a guide who will show you the areas with the best powder. Snowboarders will appreciate the lack of flats, excellent chairlifts and relatively little drag lifts to be found. Courchevel houses some excellent freestyle parks to try out too. Everyone can have a go on the Family Park with waves, rails, jumps, and a boarder-cross track for racing down. The more experienced can also enjoy grinding rails and tables in the Bio Park. After a day on the slopes, La Tania is a peaceful base to unwind in. The atmosphere is mostly quiet and relaxed, but some après buzz can be found for those seeking it. Le Bouc Blanc is a popular restaurant at the top of the gondola from the village, ideal for relaxing in the sun with a drink on a deckchair. Pub Le Ski Lodge attracts most of the nightlife, hosting regular live music performances and themed nights. The crowds gather for happy hour and they air the major sporting events so sports fans won’t miss the big game while on holiday! La Taiga is a recommended restaurant and has a lovely lounge bar downstairs, perfect for a quiet drink on comfy sofas by the fireside. Those craving some more crazy après can always end their day in Meribel and get a taxi back. For meals out, La Ferme serves traditional French Savoyard cuisine such as mountain favourites tartiflette, fondue and raclette. Fine diners can indulge at Le Farçon Miche, the local Michelin Star restaurant, sure to get those taste buds tantalising on a special night out. For a quick take-away option, Snow Food does great sandwiches and pizzas. There are some awesome activities to get up to across the resort as well. Don some snowshoes for a guided walk up through the snowy scenery. You can hire a local beauty therapist to visit your accommodation for some stress-relieving pampering. Since the resort is traffic free, kids can safely have fun in the snow outdoors. Also outdoors, you can go paragliding, husky sledding or take a hot air balloon ride through the mountains. Light aircraft flights are available for a bird’s-eye view tour with spectacular sights and over in Courchevel there’s an Olympic standard ice rink and a ten-pin bowling alley. When is the best time to ski La Tania? The piste bashers are busy maintaining the slopes throughout the ski season in La Tania which usually runs from December to April. The temperatures are lower earlier in the season and the resort usually sees a good amount of snowfall through to April. On less sunny days, the tree-lined landscape will work well for improved shelter and visibility. Later in the season the north-facing direction of the slopes will help to maintain the snow conditions, as well as the 1500 snow cannons heavily covering the linked ski area. Head up the Col De La Loze for more reliable snow at above 2000m. As part of the Three Valleys you can buy a pass to ski in the snow-sure Val Thorens. The little village is a good destination for a quieter stay during the school holidays, or if you’d like to avoid the crowds on the slopes altogether then aim to book during off-peak dates here. 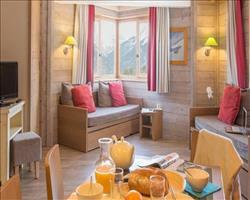 La Tania is renowned for being a really family friendly resort. Set back in a tranquil location in the forests, it’s a traffic-free treasure that kids and adults will love. In the village centre you’ll find apartments like the Grand Bois Apartments and the La Tania Apartments offering doorstep skiing, great access to the lifts and just a minute from the ski school meeting point. These couldn’t be better located if you’ve got little ones in ski school who won’t want to lug their equipment about. Let us know if you need childcare facilities in your accommodation and we’ll show you the best places to stay. In terms of the ski area, there are two ‘Zen’ (Zone Evolution Novice) slopes - one just above the village - that are quiet, gentle little greens perfect for all ages to find their feet on skis or snowboards. An excellent choice between professional ski schools is available. For the very young there are also Kindergarten services offering a fun and safe environment for children too young to ski whilst parents get off and enjoy the valleys for a while. Pre-booking such childcare is highly recommended, especially before peak holiday dates. Older children can check out the parks over in Courchevel – the Family Park is designed so that all ages can give the jumps and rails a go. Choose packages with flights and transfers or channel crossing for self-drive. 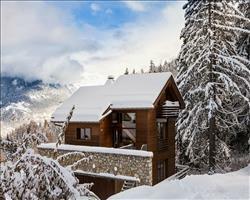 Our friendly ski specialists are on hand to help you find the ideal family accommodation - give us a call! Hotels with large amounts of rooms are a good idea for groups, where everyone can book into a room that suits them and enjoy on-site restaurants and bars. Chalets are a cosy alternative with a more intimate feeling - check out Chalet Jennifer for a traditional alpine accommodation with pine wood interiors. Our apartments can work well for groups too – the Grand Bois Apartments can sleep up to 6 adults and are situated in the village centre, just a minute from the lifts. Our inclusive packages will take the hassle out of booking for big groups and with group discounts available you’re sure to save money with Sno. Make things easy for yourself and give our ski specialists a call – we’ll help sort out your holiday and keep things simple. La Tania is great for groups looking for cheap access to amazing ski slopes, or who prefer quieter surroundings away from the more built up resorts. A standard Courchevel ski pass will gain you access to a wide range of slopes for beginners, intermediates and advanced skiers and snowboarders. For the more upbeat après, the Pub Le Ski Lodge hosts live music and themes nights – think live bands and ace cocktails. The bar in La Taiga is ideal for a quiet drink in the warmth on comfy sofas. Having worked as a Chalet Host in La Tania over the 2013/14 season, I thought I'd share some of my views on this lovely little resort. The resort itself is really conveniently located, around 2 1/2 hours from Geneva, 1 1/2 hours from Chambery and about 25 minutes from Moutiers. I drove to and from airports with guests most Saturdays, and the route is very easy going - it's only for the last 20 minutes or so that you're going up twisty mountain roads. The resort itself is fairly modern - built for the press at the 1992 Winter Olympics - but the buildings have all been tastefully done. Think log cabins nestled in the trees rather than huge 70's style concrete buildings. There's a lovely community feel to the place, with many people living here year round, and although it's smaller and less well-known than the major 3 valleys resorts there's still a great buzz most of the time. The main centre is traffic free, so it's great for families with little kids, and there's a good selection of restaurants to suit all tastes and budgets (from tartiflette and pizzas to Michelin Star cuisine!). Make sure you check out Marmottons for the best Savoyard food you’ll ever taste. The Ski Lodge is the main bar in town and hosts regular live music nights, as well as one night a week where you buy shots to increase your chances of winning a pair of skis! It can get pretty rowdy here most evenings, so if you're after something more chilled then head to Taiga or Chrome. Taiga also hosts a weekly open mic night with local legends Stevie and Westie, which is great fun. You'll probably see other people saying this is a very family-oriented resort without much nightlife, but whilst it is great for families there's still plenty here for a group of mates to have a fun week - and it's got the cheapest drinks prices in the 3 valleys. It's also really easy to go for a big après session or night out in Meribel/Courchevel and then get a cheap bus or taxi back. As far as the skiing goes, it's the perfect base from which to explore the 3 valleys. Sat smack bang between Courchevel and Meribel, you take two fast lifts up out of the village before you come to a fork in the piste - just go right for Meribel or left for Courchevel. I found this ideal because I preferred the skiing in Courchevel, but Meribel has better après and is a great sun trap, so it was nice to be able to easily flit between the two depending on what I fancied. You can also get up to Val Thorens within an hour if you ski fast. Another huge bonus is that the long 'Folyeres' blue run through the forest back to town is easily one of the best in the 3 Valleys, if not the best! I lived in La Tania for 6 months and skied it nearly every day, and I never got bored of it. There's also some great off-piste through the trees to get home, as well as a green and a red run, so everyone will be able to have fun on the way back. The nursery slope is a good size and there’s also a dedicated kids zone right next to it complete with magic carpet. So there you have it – if you fancy a holiday in the 3 Valleys, make sure you consider La Tania as well as the big 3. 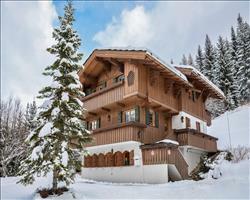 It has a great, friendly community feel to it, is usually cheaper than elsewhere in 3V, and the skiing links are ideal. It’s perfect for families but at the same time has plenty to keep a group of mates entertained for a week! 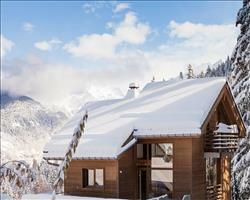 "Quieter & cheaper than Courchevel, we liked it!" La Tania’s good, it’s quieter than the big 3 Valleys resorts but had everything you needed, from the little supermarket to facilities, bars and restaurants. You have access to the same mountain as Courchevel. We skied round the corner to Courchevel one day, and thought it would be nice to stay there… But actually when you look at the price difference and the fact that from La Tania you just go up one lift, go down a run and you’re in Courchevel anyway… I think we’d go back to La Tania! The price is a lot better and it’s quieter. Apart from a couple of bars, the nightlife is very limited, however nightlife wasn’t important for us as we had plenty of food, drink and good company in our chalet. The ski area goes on for acres – miles and miles – we were lucky as it snowed the week before, and we only had one day when it was misty and cloudy. Going Sunday to Sunday worked well, we were expecting it to be crowded on the Saturday but actually it was emptier than the weekdays as Saturday’s the main changeover day. 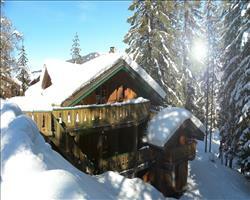 La Tania is a great area and really good for skiing. We like places where there isn’t much there, which makes La Tania perfect for us! We had the pass for the whole area which is great for everyone, it was sunny the whole time we were there and the conditions were fantastic. Because it was half term, the resort was full but perfectly bearable. A return trip to La Tania, it’s a nice quiet resort, not too busy but with good links to Courchevel. It was really hot for February this year, but still one of the best skiing weeks we’ve had. I’d skied in the Trois Vallees 20/30 years ago and it was nice to return. I’d recommend La Tania, obviously one of the best things about it is the location in the Trois Vallees. It’s also cheaper than the other bits – we went to one of the local bars to watch the football a couple of times. It wasn’t cheap, but it’s nothing like you’d pay elsewhere. They managed to keep the snow going in April which was good. "Not for everyone, but I like it"
Not everyone would like La Tania as it’s quite a small place but I’ve visited a couple of times now and I like it. 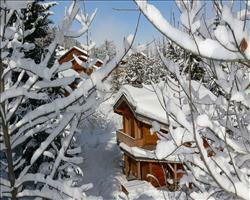 It’s very convenient for the ski area, you can easily go over to Courchevel where there’s plenty of variety. The weather was pretty good for January too. 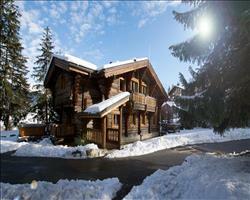 We enjoyed La Tania as a couple and would recommend it. It’s not too mental, the village is quiet, but there are some nice bars. Overall we thought it was really nice. "The quiet end of the 3 Valleys"
We had a great group holiday here. I’ve been to the 3 Valleys many times, but this was my first time staying in La Tania. I really liked it. It’s a nice, little, quiet place. It’s slightly away from the cut and thrust of the 3 Valleys, which is good. There are only a few bars, but there’s enough there. We like to make our own fun in the evenings anyway. Also you only need to take one lift and you’re up in the 3 Valleys, which is a great ski area. We had perfect snow while we were there. 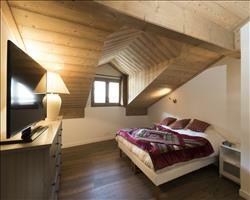 I’d particularly recommend La Tania for people who like somewhere a bit quieter. "Snow not brilliant but we had an excellent time!" La Tania is a place we’d been to before and always said we’d go back. It’s very easy to get to Courchevel, Meribel and Val Thorens (although you’d have to be a good skier for VT) – you just get the lift from the village and go in either direction. It was ridiculously hot this time round and the temperature went up to 26°C (I've just got back from another holiday in Greece which was colder!). You could ski 2-3 hours before lunch and a bit after, the snow held up really well but was just a bit heavy packed which I'm not fond of. We’ve skied in the area when there’s been really good snow and then it’s perfect. On our chalet host’s night out we decided to push the boat out and go to the Michelin star restaurant, it turned out that a 3 course meal was only about 15 euros more than anywhere else and I’d definitely recommend to go there. Some people might find the village quiet and young people might not find enough bars, although there are one or two. But this is why we like it! "Fantastic snow and ski in / ski out"
La Tania is easy to get to (you can drive here or take the Eurostar to get here) and it’s close to everything. 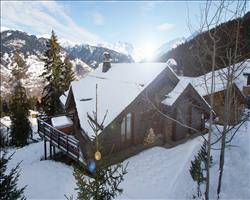 You have access to the whole 3 Valleys from La Tania. 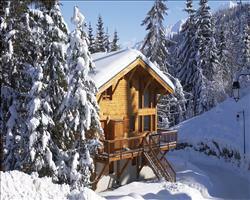 I had fantastic snow when I stayed here and my accommodation was ski in / ski out. It’s a quiet place, but you can go up to Meribel which is busier. It was pretty cold when I was here. "Be careful you don't get stuck in le Praz at the end of the day!" I had never been to La Tania before this trip. It was good! The only downside was that one afternoon we missed the last lift home and ended up having to get the bus back from le Praz, but we just hung out in one of the bars there and had a few beers, it wasn’t a big problem. The lifts down to La Tania don’t run as late as some of the others around resort so you have to be careful about getting back. There are some decent runs down into La Tania itself, there are some harder ones and I think a green one as well for beginners. We had a good mix of people in our group and everyone found it fine. Total beginners could also get the bubble lift down if they were struggling.